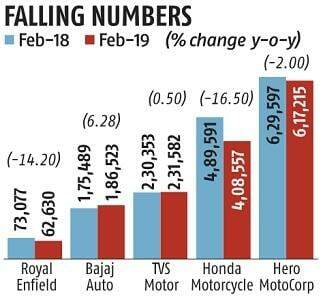 Extending the sluggishness of previous months, two-wheeler sales remained weak in February over the same month a year ago amid high level of unsold stock and tepid buying sentiments, shows monthly sales data released by companies last week. Auto firms in India count dispatches to dealers as sales. 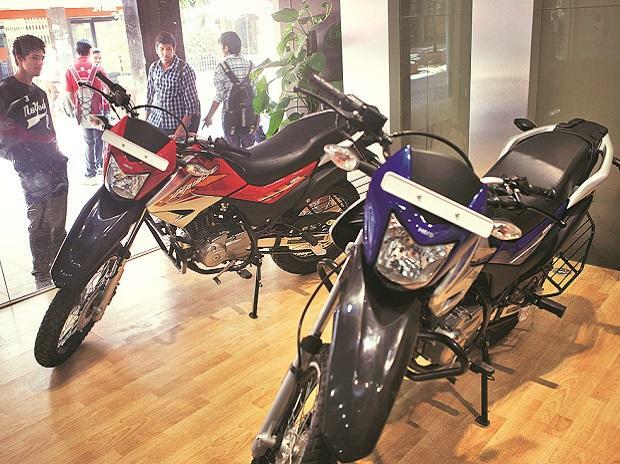 Cumulative sales at India's top five scooter and motorcycle makers including Hero MotoCorp, Honda Motorcycle and Scooter India, Bajaj Auto, TVS Motor and Royal Enfield dropped 5.73 per cent to 1506,507 units over the same month a year ago. The overall volumes were dragged down by sales decline of 2 per cent at Hero and 16.5 per cent at Honda— the two largest in the pecking order. Amid the gloom and falling sales, Bajaj Auto was the only notable exception. The maker of Pulsar and Discover models saw a 6 per cent year-on-year growth during the month. Apart from Bajaj Auto, TVS Motor was the only other manufacturer that escaped a skid in sales. It saw sales rise, albeit marginally, by 0.5 per cent during the month.